Most beans are susceptible to Rust caused by Uromyces appendiculatus, but the disease occurs sporadically and is important only under prolonged periods of warm, moist weather. Symptoms develop on leaves and pods as pustules of red-brown powdery spores (urediniospores) which rupture the epidermis. They are often surrounded by a yellow halo. Rust fungi have extremely complex life cycles, often involving two hosts and up to five different spore stages. The bean rust fungus exists in at least 35 pathotypes and is extremely variable. 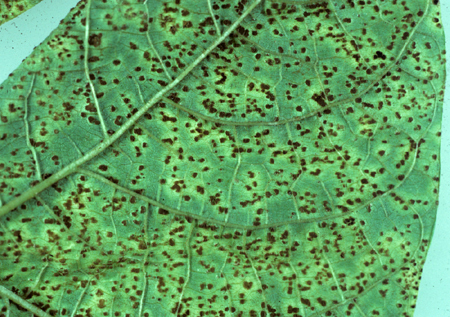 Pustules of brownish-red, powdery spores (urediniospores) develop on leaves and stems. Severely infected leaves turn chlorotic, dry, and decline. Later, black to brown teliospores form within pustules and enable the pathogen to survive between crop cycles and initiate new infections. Severe infections can result in defoliation. Diseased leaves lose photosynthetic capacity resulting in losses in vigor and yield. Rotate bean with non-host crops. Plow under infected crop residues. Select planting dates and schedule irrigation to avoid long periods of leaf wetness when temperatures are warm. Disinfect poles in production of pole beans. Avoid over application of nitrogen and ensure adequate potassium fertilization.